A former coworker of mine used to say he wasn’t being lazy, he was being efficient. While we would usually argue back that it wasn’t efficient if it ended up taking us longer to figure out what he’d done, I do think he had a point. And as you know, I apply this principle to cooking quite a bit! If I can find a quicker/easier way to do something and save myself some time in the kitchen, I’ll do so. So I’ve had this idea floating around in my head for a while. 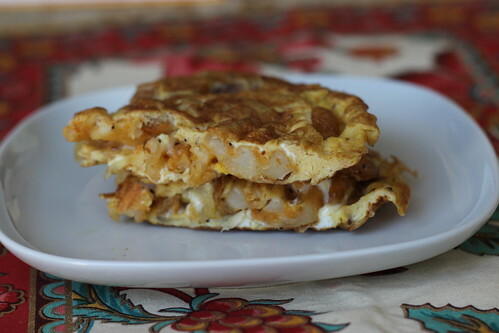 I wanted to try a spin on the traditional Spanish tortilla, which is an open-faced omelet made with potatoes, onions, and olive oil. What I didn’t want to do was have to slice up potatoes and fry them in oil. Lazy, lazy, lazy. I figured I could skip that step and use fries instead. 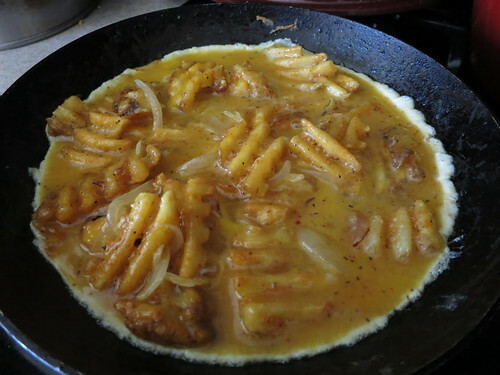 By baking the fries, I would also not have to use as much oil in the whole dish! I decided to use waffle fries so that when the tortilla is cut into wedges there would be a fun shape from the fries. You know what? It worked! I love potatoes and eggs, so this was a great recipe to play around with. And when Mr. Spice and I go to Spain next month I can have the real deal then. 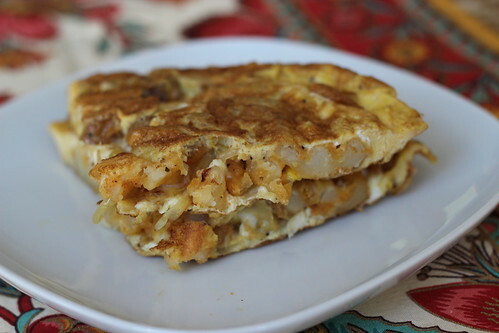 It may not be a traditional Spanish tortilla, but I think this was a fun and easy twist on a classic. And an excuse to bake up some fries! Speaking of fries, some of you have been asking when my Bruschetta Waffle Fries are going to be in stores. They should be out sometime in early 2013! I’ll definitely keep you guys posted and updated, it’s so exciting! In the meantime, I just wanted to let you know about the new Alexia Tastemakers program that was just announced. Through the end of September, you can enter to become one of Alexia Foods’ new Tastemakers. As a Tastemaker, you’ll get to share your recipes, pictures, tips, and more on the Alexia Foods website and Facebook page from October through March 2013. All you have to do is visit the Alexia Foods Facebook page, click on the “Ambassador” tab, and fill out the entry form! Also, in October you can sign up to be an Ambassador, which allows you to earn points in various ways that can be redeemed for coupons and goodies. I’m obviously biased, but I think it sounds like a fun program! To help drum up some more interest in the Tastemakers program, the folks at Alexia have generously offered to give away some goodies! 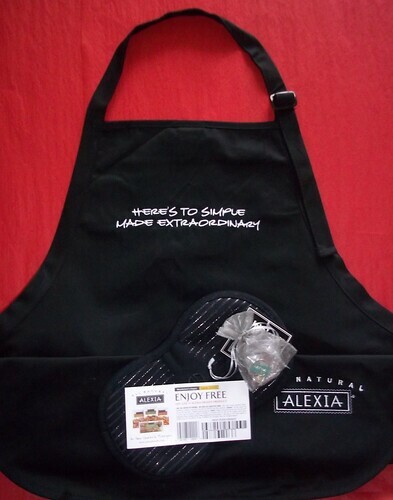 One of you will win an Alexia apron, potholder, wine charms, and a coupon for a free Alexia product! 1. Leave a comment here telling me what your favorite Alexia product is. If you end up applying to be a Tastemaker, I’ll give you 2 bonus entries! The giveaway will end on Friday, September 28th, 2012 at 9pm Eastern time. You must be over 18 and a U.S. resident. Once I’ve selected a winner, I will email you to get your contact info, so make sure you enter an email address when leaving a comment (it won’t show up in the comment). *UPDATE* Cellabella is the winner! Congratulations, please email me with your contact info! And now, time for the recipe! Preheat oven and prepare frozen fries according to package directions. Once fries are done, remove to a plate and roughly chop into chunks. Set aside. If using leftover cooked potatoes, roughly chop into chunks and set aside. Heat 1 tbsp. olive oil in small frying pan over medium-high heat. Once oil is hot, add onions and cook until onions have softened. Remove onions from heat and place on the same plate as the fries. Heat remaining olive oil in pan over medium heat. Season the beaten egg with the smoked paprika, black pepper, and salt. Add the potatoes and onions to the eggs and make sure they are distributed evenly. Add mixture to frying pan. When I make omelets, I like to run the edge of a spatula around the edges of the pan and tilt the pan gently to let some of the uncooked eggs run underneath. I do this all around the pan so that you don’t end up with cooked egg edges and a big blob of uncooked egg in the middle. Since this is basically an open-faced omelet, this logic still holds! Once the egg has started to set and firm up around the edges, take the spatula and GENTLY run it around the edge of the pan to loosen the eggs from the pan, taking care not to break the tortilla. To turn the tortilla over, you have 2 choices. You can take a large plate and place it upside down over the frying pan and then flip the pan so that the cooked side is on top and the uncooked side is on the bottom. 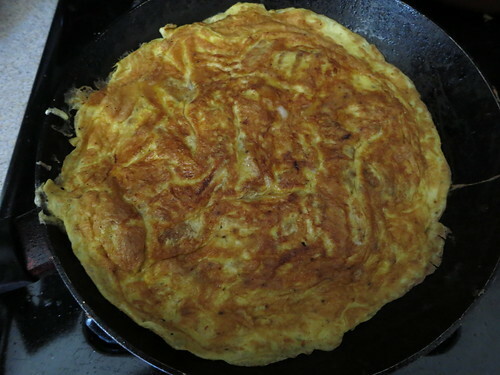 You then gently slide the omelet from the plate back into the pan so that the uncooked side has a chance to cook. Or, if you’re feeling gutsy, using the spatula you can carefully flip the omelet over in the pan, but you may risk the tortilla breaking. Either method you choose, the 2nd side of the tortilla won’t take that long to cook, so once it is done, carefully slide onto a serving plate. Cut into wedges and serve hot, at room temperature, or cold as tapas or part of a light meal. I say smart, not lazy! This looks so good, I love potatoes and eggs. I just recently tried the Alexia Wheat Rolls at my sister in laws and I was hooked! They are addictive! This is very clever. Whatever it takes to shorten to cooking time works. If I feel rushed for time, I will buy the Alexia oven fries with garlic. I also love the onion rings. I like putting them on top of burgers—gives a little sweet and crunchy flavor. My favorite it a tie between their Sweet Potato Puffs and their Sweet Potato fries. A favorite shortcut I use is to make a chopped salad (cucumbers, tomatoes, onions, etc) and mixing a ‘fancy’ jarred salsa, like peach salsa, corn salsa, or fire-roasted salsa, into it. It gives the salad a great flavor without the work! Additionally examine the types of cars Most AAA ofiefcs promote discounted tickets for theme parks, museums and other points of interest inside driving distance, and most AAA workplaces sell discounted tickets to fashionable locations just like the Walt Disney World Resort, too .